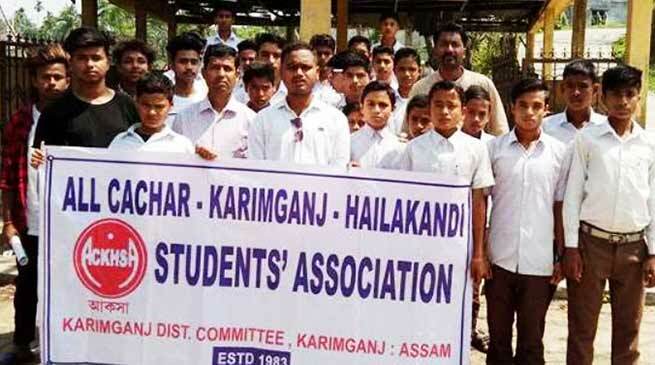 All Cachar-Karimganj-Hailakandi Students’ Association (ACKHSA), Karimganj unit, has expressed serious concern in a memorandum addressed to the Chief Minister and submitted to the Deputy Commissioner of Karimganj on Wednesday at the deteriorating law and order situation in the districts of Karimganj and Hailakandi. The heinous crime committed on a minor tribal girl identified as Ginirom Reang of village Batcherra of Hailakandi district, bordering Mizoram, has shaken the faith and confidence of law abiding citizens . The kidnapping of a Hindu girl of Rabindra Sadan Girls’ College of Karimganj in the second part of March by some antisocial elements has rocked the civil society, raising question about the efficacy and efficiency of law and order machinery. The border town of Karimganj is disturbed by the daredevil acts of thefts and robberies by antisocial gangs. They have targeted business shops and in one night seven commercial interests were looted. ACKHSA has articulated the fear and a sense of panic particularly among the women and young girls at the way the antisocial elements and goons are ruling the roost. This is a situation which can better be imagined than described.